The pharynx is a tubular neuromuscular organ where small microbes are ingested from the environment and prepared for digestion in the intestine (see Hermaphrodite Alimentary System - Pharynx for more detail). The pharynx’s anterior face is open to the environment at the buccal cavity and the posterior end connects to the intestine through the pharyngeal-intestinal valve (PIV) (APhaFIG1). The pharynx consists of 9 epithelial cells, 20 muscle cells, 9 marginal cells, 4 gland cells, 20 neurons and 6 posterior valve cells (see also Pharynx Atlas). The cells are trisymmetrically arranged into a cylinder surrounding a central lumen where food particles are contained. The lumen is lined by cuticle which is replaced during the larval molts but is stable through adulthood until death. In young adults, the pharynx is 100 µm long with enlargements in the midsection at the metacorpus and the posterior terminal bulb. The pharynx is 20 µm at its widest region in the terminal bulb. Coordinated, rhythmic contractions of the 20 pharyngeal muscle cells occur at rates between 200-300 times per minute in young adults (Albertson et al., 1976; Avery and Shtonda, 2003; Trojanowski et al., 2016; McClosky et al., 2017). These muscle contractions allow the pharynx to ingest food particles, concentrate them by expelling liquid, initiate digestion by pulverization and pass the food particles into the intestine for digestion. All the pharyngeal muscles and marginal cells are linked by prominent gap junctions and can pass rapid spontaneous electrical signals among themselves to initiate and conduct waves of muscle contractions along the length of the pharynx (Hall, 2017). For that reason, neuronal inputs only need to modulate the rates of pharyngeal pumping in response to environmental inputs. APhaFIG 1: Overview of pharyngeal structure. A. Graphic rendition of the pharynx. The metacorpus is also called the anterior bulb or the first bulb. The posterior bulb is also called the terminal bulb or the second bulb. At the anterior end, the pharynx is connected to the buccal cavity. At the posterior end, it is connected to the intestine through the pharyngeal-intestinal valve (vpi). 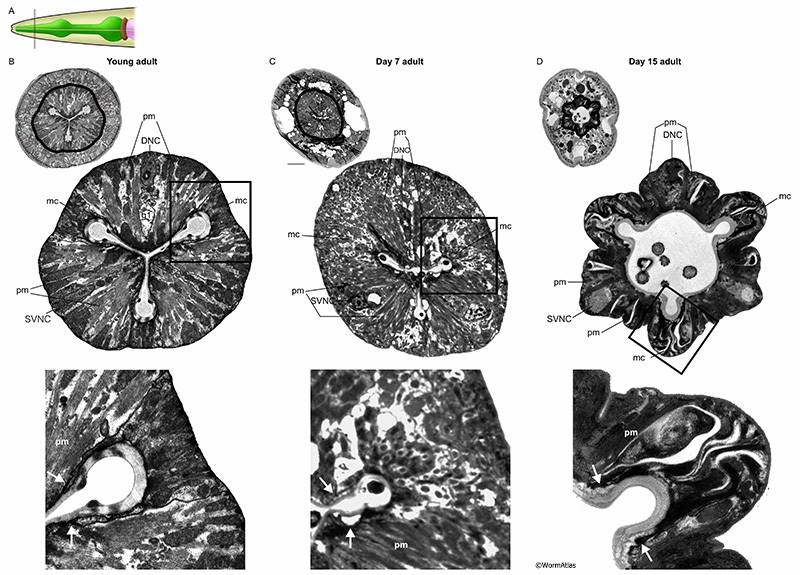 B-F. TEM sections through various parts of the pharyngeal lumen. Section levels are indicated in G. B. Buccal cavity at the level of the pharyngeal epithelial cells. (Image source: N2T [MRC] A60-23.) C. Procorpus. The channels (arrows) are seen at the three corners of the lumen. (Image source: N2W [MRC] A386-2.) D. Metacorpus at the level of the two ventral gland (Gl) openings and M3 cell bodies. Bacteria (arrows) are seen in channels while the rest of the lumen is structured as a sieve. (Image source: [MRC] JSA-71.) E. Posterior of the isthmus at the level of the excretory duct. (Image source: N2S [MRC] A1-4.) F. Grinder in the terminal bulb. (Image source: [MRC] JSA.) G. DIC micrograph of the pharynx. Pharyngeal pumping progressively declines during adulthood until the animal dies (Bolanowski et al., 1981; Huang et al., 2004; Chow et al., 2006). In young adults, peak pumping rates are 200-300 per minute during the first 4 days of adulthood. As animals age, pumping rate declines to a basal level of <50 per minute (Huang et al., 2004; Chow et al., 2006). Serotonin stimulates pumping in response to the presence of food (Horvitz et al., 1982). In old adults with very low basal pumping rates, exogenous serotonin could stimulate pumping to almost twice the basal rate (Chow et al., 2006). This finding indicates that basal pump rates do not strictly reflect pumping capacity in old adults. Rather, aging may involve reduced muscle sensitivity or response to endogenous neurotransmitter signals. In their native habitats, C. elegans likely consume a diet of microbes that grow in decaying plant matter (Schulenburg and Felix, 2017). The main food source for C. elegans maintained in the lab are E. coli bacteria. Larvae and young adults appear to consume this food source relatively efficiently and intact bacterial cells are rarely observed in the pharynx lumen past the anterior portions of the pharynx. In contrast, intact bacteria are frequently observed in the pharyngeal lumen or sometimes within the cells of the posterior pharynx in older adults (APhaFIG 2 & APhaFIG 3) (Garrigan et al., 2002; Herndon et al., 2002; Chow et al., 2006; Zhao et al., 2017). Bacterial proliferation in the posterior bulb can progress to penetration and infection of the pharyngeal cell cytoplasm, leading to death for these unfortunate individuals (APhaFIG 2D) (Zhao et al., 2017). The consequences of bacterial survival in the lumen are not fully understood, although this may be a more benign event for the animal. One study found that pump rates were not significantly different in older adults with or without bacterial plugs in the lumen (Chow et al., 2006). 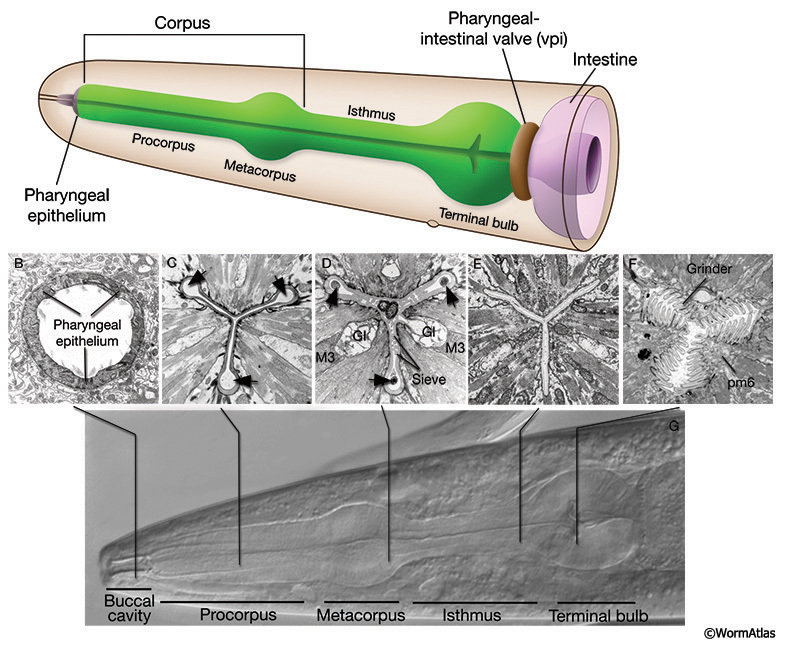 It may be easier for intact bacteria to push past the pharyngeal valve into the intestinal lumen than to penetrate the luminal cuticle of the pharynx, and one typically finds a vastly larger collection of intact bacteria inside the aging intestine than within the pharyngeal passageway (McGee et al., 2011). In aged adults, pharyngeal pump rates are consistently higher in animals maintained on bacterial food that has been growth-inhibited or killed (Chow et al., 2006). 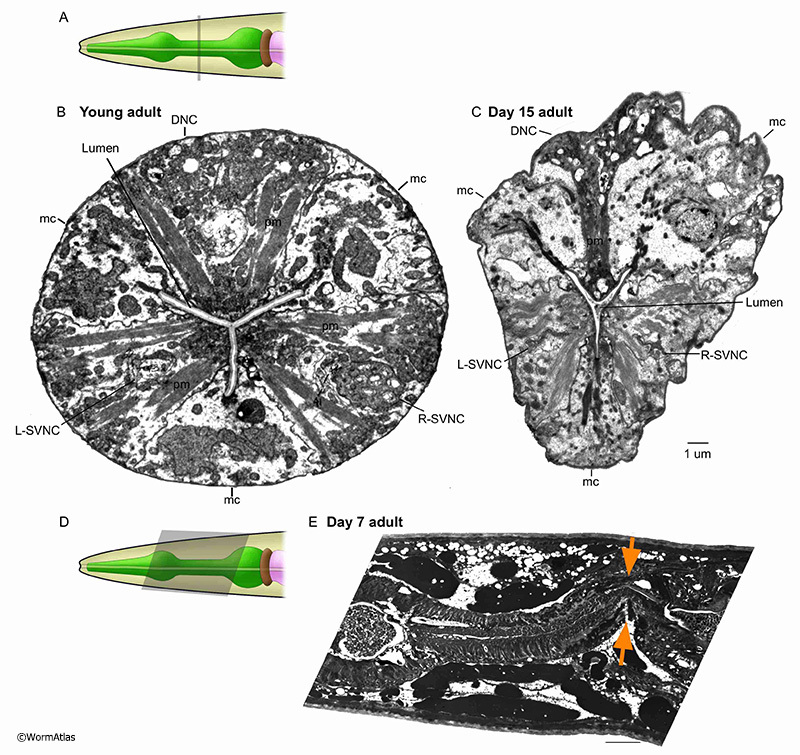 Bacterial accumulation in the pharyngeal lumen was less common among animals grown on nonproliferating bacteria as a food source (Garigan et al., 2002). Growth on nonproliferating bacteria also significantly reduced the number of worms killed by bacterial invasion of the pharyngeal terminal bulb (Zhao et al., 2017). Despite this protection, pharyngeal pumping did decline with aging in populations maintained on growth-inhibited bacteria, showing that age-related pharyngeal functional decline is most likely intrinsic to the pharynx and not due solely to microbial invasion or toxicity (Chow et al., 2006; Zhao et al., 2017). APhaFIG 2: Bacterial cells invading the pharynx of day 7 adults. Bacterial cells can be seen in the lumen at any age and invading into pharyngeal muscle cell cytoplasm as early as day 7 of adulthood. A. Diagram of the head, grey box shows approximate positions of (B-E). B. Procorpus region of young adult hermaphrodite. (Image source: N2T [N. Thomson] 402.) C. Intact bacteria are present in the anterior lumen of this 7-day-old adult. (Image source: N826 [D. Hall] G5875.) Ch, pharyngeal channels; pm, pharyngeal muscle; mc, marginal cell. Bar, 1 micron. D. Intact bacterial cells are seen inside the pharyngeal muscle cell cytoplasm of this 7-day-old adult, compressing any remaining myofilaments to the lateral edges of the cell, while bacteria tend to dominate the center of each muscle. The marginal cells contain some vacuoles, and are distorted in shape, as the muscle volume swells to accommodate invading bacteria. Intact bacteria are sometimes seen in the anterior lumen of young adults (i.e., APhaFIG 4B) but less frequently within the procorpus region. (Image source: N822 [D. Hall] 4627.) Bar, 5 microns. E. Enlargement of boxed area in (D). The massive swelling of bacteria in the ventral left pharyngeal muscle has obliterated any evidence for the subventral nerve cord here, and likely abolishes some neural connectivity here for pharyngeal neuron M1 and for the sensory processes of neurons I1L and I2L. (Image source: N822 [D. Hall] 4629.) Bar, 5 microns. APhaFIG 3: Debris and intact bacteria in procorpus lumens of 15-day-old adults. Abnormal substances in the pharyngeal lumen are more prevalent in older adults. 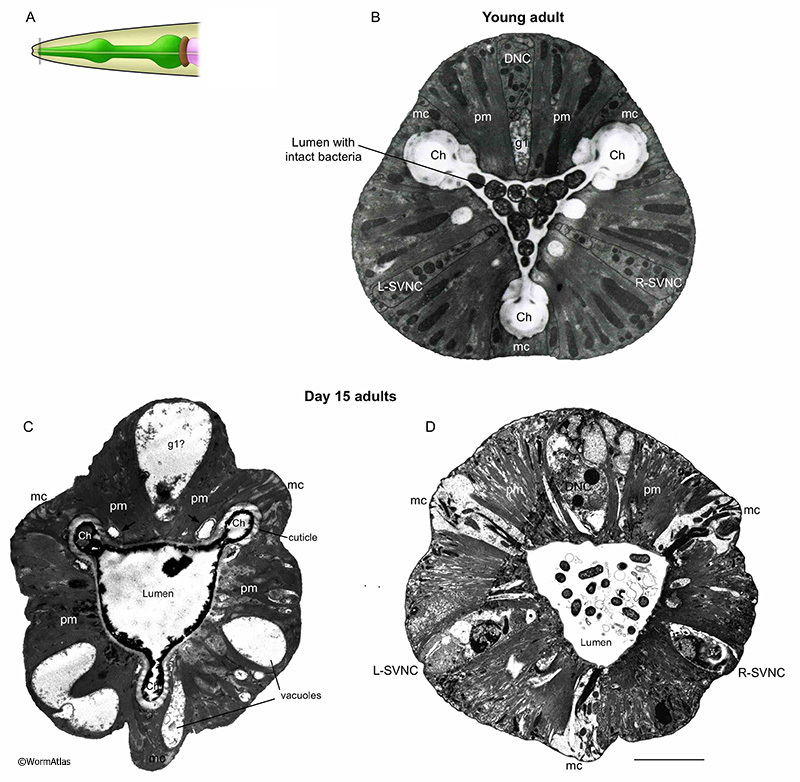 Images from procorpus region of young adult (B) or 15-day old adults (C&D). A. Black line indicates approximate position of the images in B, C&D within the procorpus region. B. In the procorpus of a young adult, the compressed pharyngeal lumen has channels at each of the vertices (Ch). White arrow indicates the cell bridge between syncytial pm muscle cells. C&D. In the 15-day old adults, the channels are preserved but the pharyngeal lumen is widened and contains unusual contents, such as debris (C) or intact bacterial cells (D). (Image sources: B, N2T [N. Thomson] 250; C, N813 [D. Hall] G538); D, N832 [D. Hall] T281.) Ch, pharyngeal channels; pm, pharyngeal muscle; mc, marginal cell; g1, g1 gland cell process. Bars, 1 micron. APhaFIG 4: Intact bacteria in the terminal bulb lumen of a 15-day-old adult. 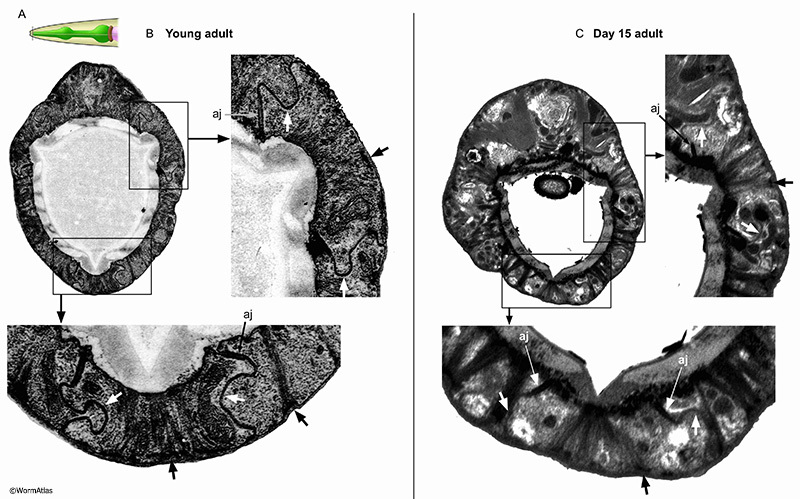 Images from the terminal bulb region of a young adult (B) or 15-day-old adult (C). A. Pharynx diagram with black line showing approximate position of regions shown in B&C. B&C. In the terminal region of the pharynx, near the grinder, intact bacteria are observed in old adults, while in young adults only debris from chewed-up bacteria is seen. Note also that the lumen becomes distended as these intact bacteria accumulate. (Image sources: B, N2T [N. Thomson] 339; C, N829 [D. Hall] W004.) Ch, pharyngeal channels; pm, pharyngeal muscle; mc, marginal cell; g1, g1 gland cell process. Bar, 1 micron. The appearance of the pharynx changes dramatically during the adult lifespan (for review see Herndon et al., 2017). Under Nomarski optics, the organ becomes progressively more disorganized and swollen (Herndon et al., 2002; Garrigan et al., 2002). In some cases, swelling may be due to bacterial invasion or the appearance of large vacuoles in the pharyngeal cells. This is most commonly seen in the terminal bulb, although other pharyngeal regions can be affected. Along the length of the metacorpus and the isthmus, structural weakening allows the tissue to bend or kink (APhaFIG 8E). Variations in the progress of aging from cell to cell, and from animal to animal results in wide range of aging phenotypes in the pharynx. By comparing the different animals depicted in the figures here, one can see that sometimes muscles have only shrunken a bit during aging, while marginal cells and/or gland cells have swollen dramatically, while in other animals the muscles show major changes in advance of other defects, or in combination with damage to the local neurons. Similar to what has been shown for the rest of the body, damages occur stochastically in no particular order (Herndon et al., 2002). In some cases, the muscle cells swell due to bacterial infection, and in most other cases they shrink, distorting the overall look depending on those local conditions. Swelling of the lumen often forces the pharynx to balloon outward, while weakening of the outer basal lamina may allow the outer surface of the whole organ to become irregular and rugged, compared to the smooth surface of the young adult pharynx. The anterior tip of the pharynx is created by nine interlocking epithelial cells, named e1, e2 and e3 (see Hermaphrodite Alimentary System - Pharynx; PhaFIG 5A-C). These epithelial cells are reinforced internally by intermediate filaments connecting the lumen pharyngeal cuticle with the basement membrane facing the pseudocoelom. Electron-dense half desmosomes anchor the filaments to the basement membrane. The epithelial cells have interlocking cell boundaries anchored by adherens junctions at the lumenal cuticle, providing a strong seal between the pharynx lumen and the basement membrane (see PhaFIG 5D&E). The lateral cell borders of these interlocking cells are studded with very large gap junctions, which may also strengthen those borders. In some older adults, tissue deterioration is extensive enough to blur epithelial cell boundaries. In other animals, the pharyngeal epithelium is maintained (APhaFIG 5). In these older animals, the reinforcing filaments and half-desmosomes appear to persist, without obvious fragmentation. The adherens junctions between cells and the basement membrane are also present. A major change appears to be more flaccid boundaries between pharyngeal epithelial cells, without the characteristic interlocked pattern in young adults. It is uncertain whether these more flaccid lateral borders have lost their characteristic gap junctions during the aging process. The pharynx contains twenty muscle cells arranged longitudinally in segmental rings to create the pharynx’s tubular structure. All of these muscles contain radial muscle fibers, connecting to the outer (basal) plasma membrane at the thickened basal lamina of the pharynx, and to the apical cuticle that lines the lumen (see Hermaphrodite Alimentary System - Pharynx; MusFIG 17). The pm1 and pm8 muscle cells are positioned at the anterior and posterior tips of the pharynx, respectively (see PhaFIG 6). Due, in part, to their relatively small size, little is known about how pm1 and 8 may change during aging. 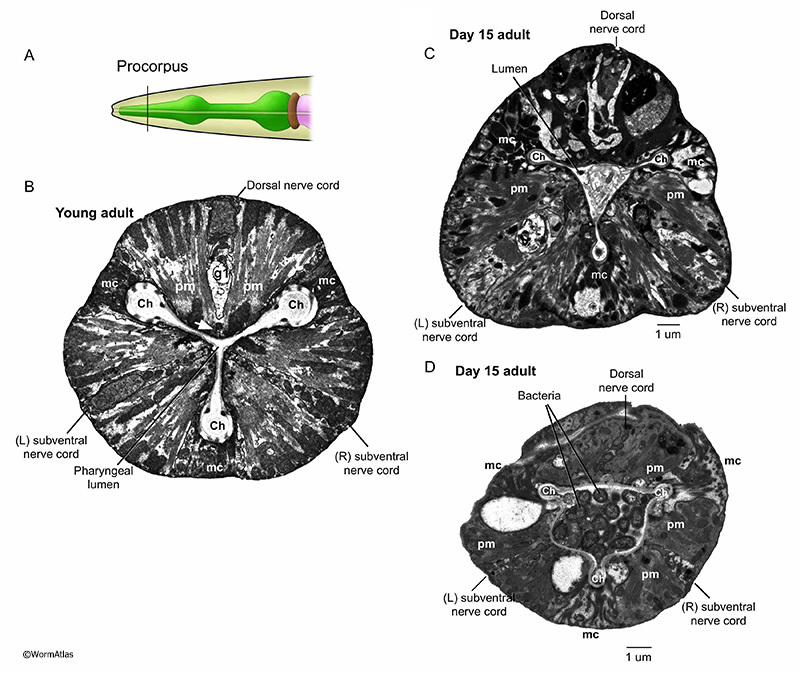 The main pharyngeal structure arises from pm2 through pm7, which each exist as three cells arranged around the central lumen in the dorsal and right and left subventral positions, rather like slices of a pie. These 3-cell rings encircling the lumen are then stacked from pm2 and pm3 in the procorpus, to pm4 in the metacorpus, pm 5 in the isthmus, and pm6 and pm7 in the terminal bulb. Within each 3-member ring, these muscles are separated from their neighbors by the marginal cells. Each pharyngeal muscle (for pm2 to pm7) is actually composed of two fused (syncytial) cells, wrapped around the one of the pharyngeal nerve cords, thus containing two nuclei. 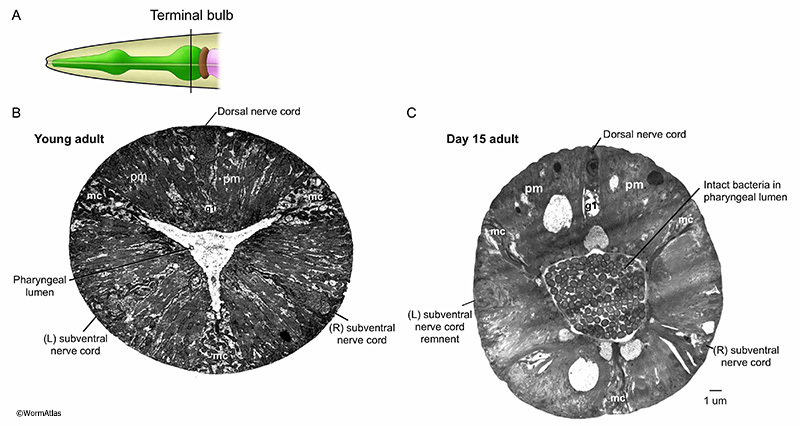 A narrow cell bridge connects the two halves, and lies at the apical extreme, between the nerve cord and the luminal cuticle (APhaFIG 3B) (see Shemer et al., 2004). Interlocking fingers bind each muscle to its neighbors along their lateral membranes (linking to marginal cells) and along their anterior and posterior borders (linking to muscle cells of the next segments). In addition, those same borders typically include prominent gap junctions and apical adherens junctions, which should strengthen the physical attachment of all cells to their neighbors, and allow passage of electrical signals along the full length of the pharynx, and within all cells of each segment (Hall, 2017). In older adults, the muscle cells frequently appear disorganized, deformed and shrunken. They may pull away from the cuticle attachments at the apical border (APhaFIG 7D). All pharynx regions appear to be similarly susceptible to muscle thinning and deterioration, with fewer myofilaments per bundle, and often under partial contraction, permitting the lumen to widen in most regions. These changes likely cause pumping to become less effective with age. Systematic analysis of large numbers of animals would be needed to identify whether any particular pharyngeal regions were protected from muscle thinning and weakening during aging. As already mentioned, bacterial cells may invade the anterior or posterior pharynx to proliferate within the pharyngeal muscles causing local swelling and distortion of the muscles, and sometimes abrogating neuronal inputs. Thus the aging pharynx muscle can become a patchwork of thinned intact muscles and swollen, infected muscles to seriously distort the shape of the whole organ.. The marginal cells are support cells interdigitated between the muscle cells along the length of the pharynx (see Hermaphrodite Alimentary System - Pharynx; PhaFIG 6). In the anterior region, three mc1 marginal cells separate the anterior muscle cells (see PhaFIG 7A). These are followed by three mc2 cells separating muscle cells in the middle region of the pharynx (see PhaFIG 7B). In the terminal region, one syncytial mc3 cell with three nuclei separates the terminal region muscle cells. Marginal cells are thought to give support to the pharyngeal muscle cells and the entire structure during contraction-relaxation cycles. They do not contain myofilaments, but instead feature long intermediate filaments connecting radially to the apical cuticle and to the basal basement membrane of the pharynx. In older animals, the marginal cells appear expanded and swollen, in contrast to the shrunken muscle cells. Marginal cell expansion may result from large local vacuoles, detachment of the intermediate filaments, or cytolysis and swelling to fill space made available by muscle cell loss. The marginal cell interiors appear disorganized or even lytic in older animals (APhaFIG 7D). Mitochondria that were plentiful in the marginal cells of younger adults appear to be missing or fragmented in marginal cells from older adults. Intermediate filament bundles seem more wavy or twisted, rather than straight. In rare cases the marginal cells can also be invaded by bacteria, although this seems more common among the muscle cells. The pharynx contains dedicated glands and nervous system, wholly contained within the pharynx proper, and lacking any separation by basement membranes from the muscles and marginal cells (see Hermaphrodite Alimentary System - Pharynx). Five gland cells, with cell bodies in the terminal bulb, secrete substances to the lumen via long ducts projecting anteriorly. The gland cells may release enzymes to digest food or, potentially, the cuticle of the lumen for molting, or the eggshell for hatching. The 20 neurons in the pharynx have cell bodies located in metacorpus and terminal bulb, with processes extending along the dorsal, or left or right subventral nerve cords. The pharyngeal nervous system controls the rate of pharyngeal pumping in response to sensory cues indicating the presence of food (Trojanowski et al., 2016). In young animals, pharyngeal nerve cords progress neatly along the longitidunal axis within the enclosing muscle cell (see PhaFIG 9A-E). However, in older adults the nerve cords may become distorted in shape, shrunken in process size and their contents less organized. Vacuoles become prominent, possibly within neuron cell bodies. 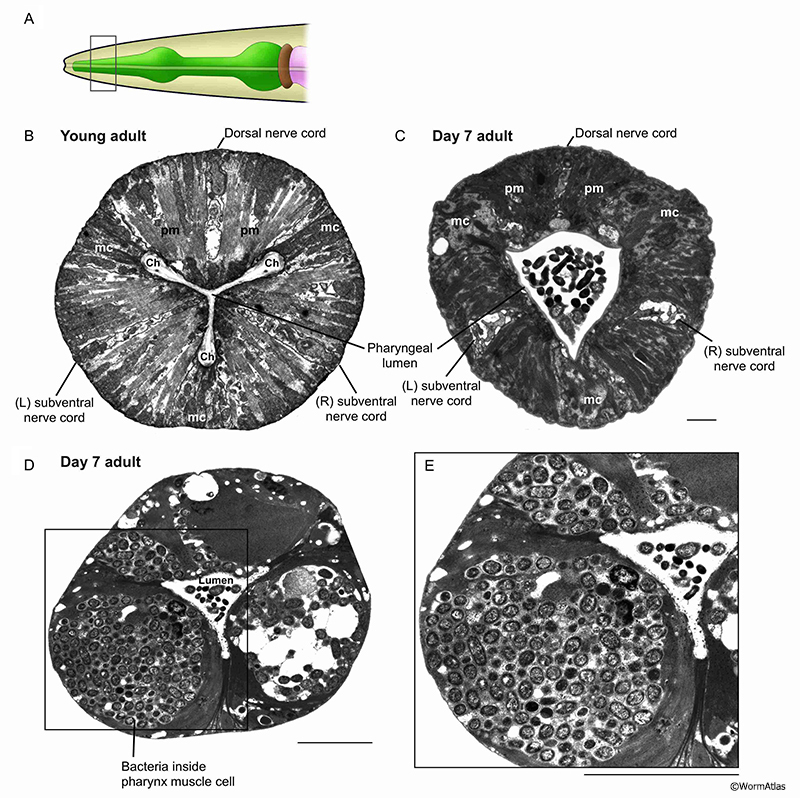 While individual nerve and gland cell processes are identifiable in the young nerve cords, the contents can quite difficult to interpret in older animals. APhaFIG 6C shows one possible swelling of a G1 gland process near its normal place of outflow into the pharyngeal lumen. Other large vacuoles may lie within one of the nerve cords, and another potentially lies inside a ventral marginal cell. As shown in APhaFIG 2E, some portions of many pharyngeal neurons may be severely damaged or eliminated by bacterial invasions in older adults. Such events will possibly kill some neurons, and surely abrogate any neuronal inputs or outputs to local portions of the musculature. Thus pharyngeal pumping will become less coordinated or controlled, and surely weaker in such individuals, even while the whole animal remains alive. These bacterial invasions occur in only some animals. This variability can be seen seen when comparing the 15-day adult pharynges in APhaFIG 3, which remained inviolate, to the badly damaged 7-day adult pharynx in APhaFIG 2. Therefor,e nerve-muscle connectivity will decline much more slowly, and is due to different causes in the absence of an invasion. APhaFIG 8: Isthmus deterioration during aging. A. Diagram showing the approximate positions of B&C in the pharyngeal isthmus. B. Cross-section from the isthmus region of a young adult pharynx. The pharyngeal muscles (pm) and marginal cells (C) are triradially arranged around the central lumen, which is compressed in this region. The nerve cords (DNC, L&R-SVNC) within the pharynx muscles are different in each segment in this adult. (Image source: N2T [N. Thomson] A104-11.) C. Cross-section of the isthmus region in this 15-day-old adult showing deterioration of the dorsal pharyngeal muscle and all three of the nerve cords. The marginal cells appear intact but disorganized. The lumen remains compressed but contains debris. Bar, 1 micron. (Image source: N813 [D. Hall] G531.) D. Diagram of C. elegans pharynx with grey shape showing the approximate position of E. E. Lengthwise section of the pharyngeal isthmus from this 7-day adult shows weakening and kinking of the structure (orange arrows). (Image source: N824 [D. Hall] N4924.) Bar, 5 microns. This chapter should be cited as: Wolkow, C.A, Herndon, L.A. and Hall, D.H. 2017. The aging pharynx. In WormAtlas. Edited for the web by Laura A. Herndon. Last revision: November 28, 2017.